Does Any DVD Cloner Platinum support home-made DVD copying? Q: Does Any DVD Cloner Platinum support home-made DVD copying? A: Any DVD Cloner Platinum supports copying / burning / ripping home made DVD. But it may takes more than to scan and analyze the DVD at the beginning. Hope you can wait patiently. 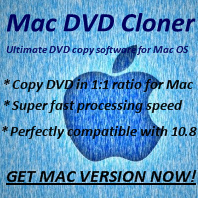 Any DVD Cloner also allows you to copy or burn home made DVD!